I like this little sitting area- the greens make me happy. I love that I live in StL , but you are the one introducing me to images from around here! THANKS! love it! Symmetry makes me happy. This is such a cute little seating area! Okay, I'm just a little bit addicted to symmetry and this is probably the ultimate example of it! LOVE. My goal this year is to try to loosen up with this addiction and try to be more comfortable with other arrangements...well see. yummy, love pairs of anything! So glam, and I love green! Perfect. I could move right in!!! 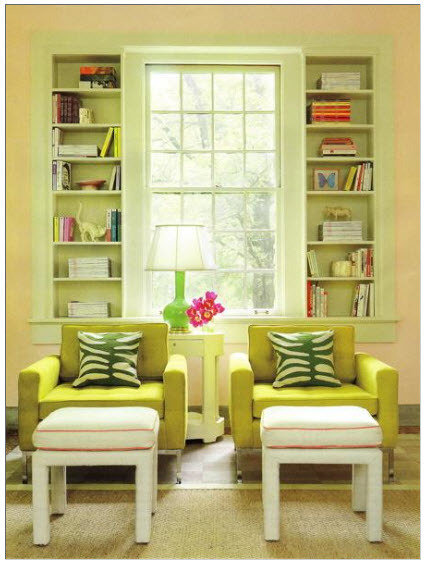 I love that the bookcases resemble shutters, and are styled so well! ah! i'm in love with it! i love the lines, symmetry and the colours! great find! Such a sweet spot. Super into those pillows...need them! Love this too! Very cute sitting area and I love the ottoman/stools as well. It reminds me of Spring. Very cute pic. Cute! Love the colors and it's a nice departure from a traditional love seat. The green AND the shelves make me happy. So adorable! I would love to sit there and read a book! i love this. so brights and cheery!! I can so picture myself having a latte and reading a mag there. Such a lovely space! so pretty! And I love the symmetry. Oh, I'm drooling over those cute chairs.